The start of the €1.14 trillion ‘easy money’ program is causing the European sovereign debt market to go a bit haywire, with investors scooping up debt they know they will lose money on. The €60 billion per month bond buying program, which came into force March 9, is pushing up the price of 10-year bonds, which makes the yield, or the return investors earn fall. On Tuesday, Germany's 30-year bund yield dropped below 0.75 percent for the first time ever. It has since recovered to 0.89 percent. The yield on Germany’s benchmark 10-year bond fell to 0.31 percent and France’s 10-year bond fell to 0.60 percent at the time of publication. Swiss 10-year bond yields dipped into the red in January, and were -0.13 percent at the time of publication. Other EU countries, like Denmark and the Netherlands, are also on the brink of negative yield. But traders still keep buying government bonds knowing they likely won’t see a return on their investment. It’s not dissimilar from a bank punishing customers to keep money in their bank instead of rewarding them with interest. Under the plan, the European Central Bank will buy €60 billion of bonds per month through September 2016. Central banks across Europe will essentially ‘create’ money to pass onto banks to lend to individuals and businesses. It is hoped the loose monetary policy will combat record-low inflation and steer Europe away from deflation. Inflation is at 0.2 percent across the eurozone, far from the 2 percent goal. On the first day of the bond-buying program, March 9, European central banks were said to have bought up sovereign debt of the union’s strongest economies- Germany, France, Italy and Belgium- the WSJ reported. Austria, Belgium, Germany, Finland, France, Slovakia and the Netherlands - which make up more than 25 percent of European government bonds, a total of $2 trillion, all have below-zero yields, according to JPMorgan. Many of Europe’s central banks have slashed lending rates below 0 percent- a move that allows companies to pay less for the money they borrow, but could hurt the bank it borrow from. This essentially punishes banks, since they will receive less than initially deposited for holding onto money instead of lending it out. Record-low interest rates help a person buying a house, or a small business taking out a loan, but not investors putting money into the bond markets. It’s not all bad news for investors; because it is possible government will issue negative coupons to make up for the losses, as Germany did in 2012. “Although negative yields mean investors are effectively paying to invest, they aren’t sending a check in the post to the bond issuer. They can still receive a regular coupon paying them money,” Michael Riddell at M&G Investments told the Financial Times. However, for some investors, losing a little money on the European bond market is better than the alternative of much riskier moves. Some investors may also be hedging that the EU economy and currency will improve. Details of the QE program and how it will address negative interest rates could be addressed at the ECB’s next meeting on March 18 in Frankfurt. The extremely low bond yields- especially amongst the strongest eurozone members, is deeply concerning for the currency, which is at a 12-year low against the dollar. 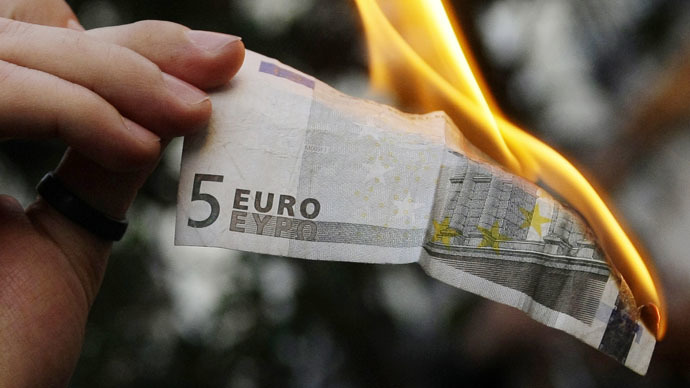 The euro is expected to weaken further under quantitative easing. The US rolled out a much larger stimulus program to save the stock markets after the 2008 financial crisis, and for the most part has succeeded in its aim, with the DOW, S&P, and Nasdaq indexes all trading at post-crisis highs. The US wrapped up its $80 billion bond purchasing program in 2014.